“all of us are sinners. 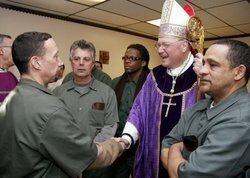 We need mercy and healing that only Jesus can give,” Archbishop Timothy M. Dolan told prisoners today at the Arthur Kill correctional facility on Staten Island, NY. The Archbishop offered the Sacrifice of the Mass for about 75 prisoners and others. The story is here. 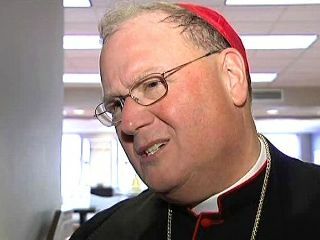 60 Minutes aired Morely Safer’s interview with Archbishop Timothy M. Dolan tonight. Watch Safer on Dolan. This is a profile of a man who is interesting and does interesting things. He’s affable, joyable, personable, cigar smoking with an eloquent defense of Catholic dogma and belief. If you want to know more about what the “American Pope” thinks gay marriage, politics, etc, watch 60 Minutes Overtime. Morely Safer comes at the interview with what I and others will call a secular, modernist viewpoint and is dismissive of the Archbishop without objectivity nor does he evoke from the Archbishop a clarity of thought. Safer, 79, freely admits that as a man and as a Jewish he wants to know more because “these type of men” are good company. Good. I agree. But I had hoped that Safer would have done a better job getting at substantive theological and philosophical foundations of the Catholic Church. 60 Minutes opened a few interesting doors into the person and ministry of the Archbishop of NY. But the report also veered into sentimentality that is thin as gruel. One does not have to sell church! Clear Catholic teaching is not based on polls and trends. Truth stands on its own two feet. 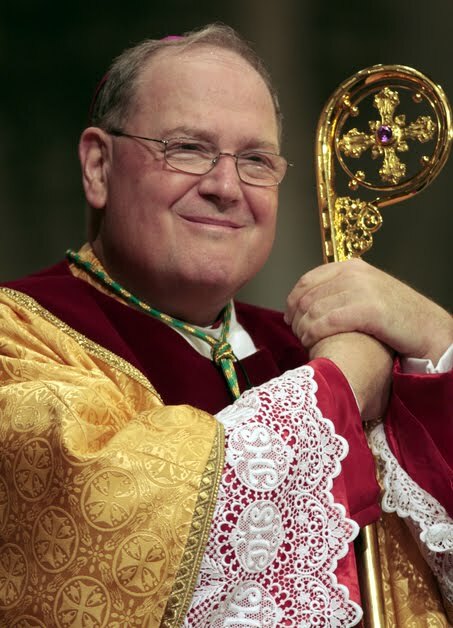 Archbishop Timothy M. Dolan’s letter to Members of the 112th Congress speaks for itself. As he notes, US Catholics are the largest religious body in the USA. 68 million, 22% of the US population. 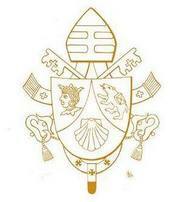 There are 195 archdioceses and dioceses with one apostolic exarchate. Other interesting statistics can be found here. greater justice to our nation and peace to our world. promote peace in a world troubled by war and violence. In 2009, 41% of the viable pregnancies in NYC ended in abortion. 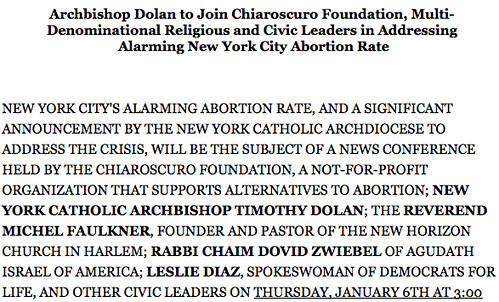 2x the national rate but it’s estimated that the abortion rate in various parts of NY are higher than NYC. 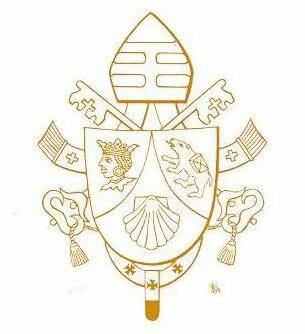 Pope Benedict XVI is building his new team of consultors for the papal agency, the Pontifical Council for the Promotion of the New Evangelization, charged to proclaim the Gospel always and everywhere in a secularized world. This new team really becomes the minds that will build the architecture for the work of the Council. This new Vatican office is slated to be one the most important Vatican offices dealing with building the Kingdom of Heaven. The head of the new council is Archbishop Rino Fisichella. The Eminent Lord Cardinals: Christoph Schönborn, OP, Archbishop of Vienna (Austria); Angelo Scola, Patriarch of Venice (Italia); George Pell, Archbishop of Sydney (Australia); Josip Bozanić, Archbishop of Zagreb (Croatia); Marc Ouellet, PSS, Prefect of the Congregation for Bishops; Francisco Robles Ortega, Archbishop of Monterrey (Mexico); Odilo Pedro Scherer, Archbishop of São Paulo (Brasil); William Joseph Levada, Prefect of the Congregation for the Doctrine of the Faith; Stanisław Ryłko, President of the Pontifical Council for the Laity; and their Excellencies: Claudio Maria Celli, titular Archbishop of Civitanova, President of the Pontifical Council for Social Communication; Nikola Eterović, titular Archbishop of Cibale, Secretary General of the Synod of Bishops; Pierre-Marie Carré, Coadjutor Archbishop of Montpellier (France); Timothy Michael Dolan, Archbishop of New York (USA); Robert Zollitsch, Archbishop of Freiburg im Breisgau (Germany); Bruno Forte, Archbishop of Chieti-Vasto (Italy); Bernard Longley, Archbishop of Birmingham (Great Britain); André-Joseph Léonard, Archbishop of Mechelen-Brussel, Malines-Bruxelles (Belgium); Adolfo González Montes, Bishop of Almería (Spain); Vincenzo Paglia, Bishop of Terni-Narni-Amelia (Italy). All of the members of the consultors have some experience of and leadership in the ongoing work of evangelization in their respective milieu. Noteworthy, several of the cardinals and bishops have connections with Communion and Liberation and Sant’Egidio, Schonstatt movements, the Emmanuel Community and the Christian Life Community. This Council is not only orienting its work to Europe but to the entire world, giving God a voice.